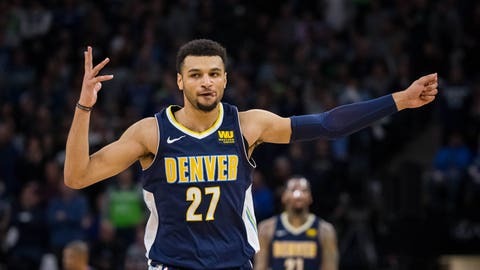 It was not so long ago when Jamal Murray poured in a career-high 48 points against the Boston Celtics and the Denver Nuggets were among the hottest teams in the NBA in the early going. A little over two weeks later, the Nuggets have encountered their first slump of the season and they hope to snap out of it Wednesday when they visit the Minnesota Timberwolves. When Murray produced the most productive game of his career in a 115-107 win on Nov. 5, the Nuggets were 9-1 and owned the second-best record in the NBA right behind Golden State and Toronto. It also was their best start in team history, but now it is a recent memory as Denver heads to Minnesota with six losses in seven games. The one win was a 138-93 thrashing of the Atlanta Hawks on Thursday, but in the six losses the Nuggets have not lost by more than 10 games. On Monday, the Nuggets led by 17 points in the first half only to wind up with a 104-98 loss at Milwaukee. Although Denver was outscored 68-35 after taking its third 17-point loss and missed 10 of its last 12 shots in the final five-plus minutes, various players were more encouraged about the direction of things. None of Denver’s seven losses this season are by more than 10 points, which is among the reasons the team is optimistic of a turnaround and a return to their early form. During the slide, Denver is averaging 108.7 points, shooting 47 percent (36.6 percent from 3-point range) and producing 26.7 assists per game. The defensive numbers are fairly similar. The Nuggets are allowing 107.6 points and 46 percent shooting, illustrating a streak with spotty offensive showings down the stretch. While Jokic’s production has remained similar to the first 10 games in this slide with 18.9 points and 10 rebounds, Murray is faltering. He has not reached 20 points since the 48-point game and is averaging 14.6 points on 39.2 percent shooting, though he is coming off his best game of this stretch after a conversation with coach Mike Malone. The Timberwolves are 3-1 since trading Jimmy Butler to the Philadelphia 76ers for Robert Covington and Dario Saric on Nov. 12. They posted a three-game winning streak with victories over Brooklyn, New Orleans and Portland but struggled during a 100-87 loss to the Memphis Grizzlies on Sunday afternoon. In the first game of the streak, the Timberwolves overcame 23 turnovers to beat the Nets, but on Sunday they could not work around 20 turnovers and were held below 90 points for the second time while struggling against the slow-paced Grizzlies, who forced 11 steals and 11 turnovers within the first 15 minutes. “There was a physicality to the game that we probably didn’t respond to as well as we could have or should have,” Minnesota coach Tom Thibodeau said. While Towns posted his ninth double-double with 15 points and 20 rebounds, point guard Jeff Teague will try to rebound from an ugly showing. In his fourth game back from a left knee contusion, he scored two points on 1-of-9 shooting. Still, despite the loss, the numbers are better for the Timberwolves since Butler departed. They are allowing 102.3 points per game along with a 100.5 defensive rating while also rebounding and defending the paint better. Minnesota won three of four meetings with Denver last season with two overtime victories. Each game was decided by single digits.